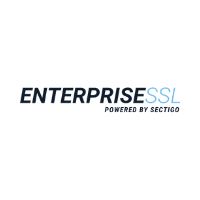 The EnterpriseSSL is issued by Sectigo. An entry level Enterprise level SSL certificate. Includes business validation and the Sectigo Secure Seal. Get your business information in the certificate details. Protect yourself with a $1.5 million warranty. Also available as EnterpriseSSL Pro and EnterpriseSSL Pro with EV. Receive a SmarterBundle package with $800 worth of SmarterTools Software when you purchase this certificate*. SmarterMail - Pro 250 Mailbox Licence. SmarterStats - Pro 50 Domains Licence. *Bundle assignments are limited to one per customer. Purchase of any SmarterTools products does not count towards this promotion. SmarterBundle products do not include upgrade protection. Assignment of bundles is processed by the end of the next working day. Confirm down ownership via whois or domain rights email confirmation. Have a registered organisation address. Registered with relevant government authority. Issuance can take 1-10 business depending on the availability of your organisation documentation. As part of the issuance process your organisation will be validated. This means your organisation name will be included within the certificate details.